If it was good enough for Jesus it is good enough for us! This is sentiment I have heard repeatedly in the discussion of Adam, Eve, science and Christian faith. It seems clear (some will claim) that Jesus regarded Adam and Eve as historical figures. He taught that Adam and Eve were historical figures. But is this actually what the available evidence in the Gospels demonstrates? What follows is an edited repost examining the topic. Jesus is the Center. Jesus is the center of our faith. We need a hermeneutic that reads scripture through the lens of Jesus Christ and through his incarnation, life, death, resurrection, ascension, and future hope. We believe in the bible because we believe in God, not vice versa. Yes, it is something of a spiral not cleanly separated. We know God and of his mission largely through revelation in scripture, but not solely through scripture. The emphasis of primacy is important though. God (and Jesus) first and foremost. Jesus alludes to Adam and Eve only indirectly. In the major reference found in the gospels Jesus takes Genesis 1:27 (So God created mankind … male and female he created them) and the institution of marriage in Genesis 2:24 (That is why a man leaves his father and mother and is united to his wife, and they become one flesh) and then describes divorce as a concession to the hardness of the “your hearts”. One need not believe in a historical Adam and Eve to believe that God ordained marriage between a man and a woman, or that this was part of his plan for creation from the beginning. One also need not believe in a historical Adam and Eve to use Genesis to teach about marriage. Dr. C. John (Jack) Collins has written a book Did Adam and Eve Really Exist? : Who They Were and Why You Should Care that makes an argument for the historicity of Adam and Eve in some real sense. When he considers the evidence in the gospels (pp. 76-78) Collins also points out that the major allusion to Adam and Eve is really a statement about marriage. He takes this one step further, though, and suggests that the fact that the law in Deuteronomy 24:1-4 allows divorce is because something changed after the beginning when God instituted marriage. This leads him to Genesis 3: “The obvious candidate for making that change – indeed the only one – is the sin of Adam and Eve, with its consequences for all human beings.” (p. 77) Thus, it appears that Collins’s main reason for thinking that Mt 19 and Mk 10 point to the historicity of Adam and Eve is because he reads in this passage a reference to the Fall. I don’t find this a persuasive argument because one need not believe in a historical Adam and Eve to realize that humankind is fallen. The events that Moses deals with during the Exodus, including the many sins of the people, are never referenced back to Adam and some primeval fall. In fact, the story of Genesis 3 plays little if any role in the entire Old Testament. The other possible references to Adam and Eve in the gospels are slim indeed. 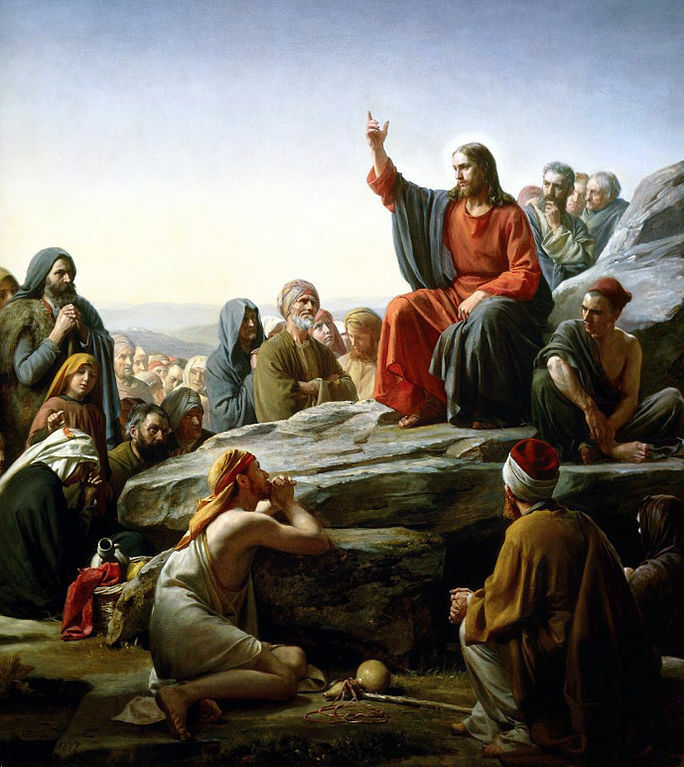 Collins notes that Jesus makes a passing reference to Abel (Mt 23:35 and Lk 11:51) – but “since this is just in passing we need not make much of it.” There is also, perhaps, a passing reference to the serpent and Genesis 3 in John 8:44: “You belong to your father, the devil, … He was a murderer from the beginning, not holding to the truth, for there is no truth in him.” Collins thinks that the phrase “murderer from the beginning” is an allusion to the serpent in Genesis 3. John Walton, The Lost World of Adam and Eve, doesn’t find the references in the Gospels worth spending any time on. We need to deal with passages in Paul’s writings (especially Romans 5 and 1 Cor. 15) and speeches (Acts 17), but the only reference he finds important in the Gospels is the reference to Adam in Luke’s genealogy. The genealogy here and in Genesis 5 and 1 Chronicles suggests to John that we should consider Adam as a historical individual, although not necessarily as the progenitor of the entire human race. Jesus may, or may not, have “believed they were historical.” I don’t think this is a question we can answer based on the text of the exchanges recorded in the Gospels. Jesus knew and used the teachings of the Old Testament text including Genesis as an accurate view of God’s work in the world. Whether he had “unnecessary” knowledge as the incarnate son is not clear, he was clearly limited in some ways. Jack Collins believes that “it is fair to say that the Gospel writers portray Jesus as one who believed both that Adam and Eve were historical and that their disobedience changed things for us” (p. 78). I take a somewhat different view and think that the Gospel writers portray Jesus as a biblically literate 1st century Jewish male who was steeped in the scripture and the culture – he was localized in a time and place. More than this, he knew his audience and was reaching out to them with his message of the coming Kingdom of God. Although we learn much from his words and ponder the message, he was speaking to a different audience in a different context. What Jesus thought about the historicity of Adam and Eve can’t be discerned, and our opinion of this rests in part on what we take as the consequences of incarnation. Non-historical characters can be used to teach true lessons. This should go without saying, but there is no necessary reason why Adam and Eve (or Abel) must be historical to make the lessons taught by Jesus true. The stories of the Good Samaritan and of Lazarus and the rich man teach true lessons whether the characters are historical or not. With respect to Genesis 1-4, we should consider the options. If Jesus, as the incarnate son, knew a truth his audience didn’t know, what would he have done? Would he have avoided the allusion on that account? Would he have added a caveat that would have made no sense to his audience? It is quite likely that he would have used the context of his audience to make the point he wished to make. It was, after all, a lesson about the institution of marriage that comes clearly from the text of Genesis. In other words, it isn’t possible to tell from these allusions and references alone what Jesus thought of Adam and Eve. So what about Adam and Eve? The question of Adam and Eve is a theological question and a hermeneutical question. It isn’t really a scientific question. Nor can it be decided by submission to the allusions of Jesus recorded in the gospels. The most significant theological questions are raised by Romans 5 and 1 Cor. 15. Paul we need to reckon with, and I look forward to working through Scot’s contribution to Adam and the Genome after finishing Dennis’s. There are ways to reconcile a literal Adam and Eve with the scientific data. Reconciling a literal Adam and Eve with the scientific data requires something of a stretch, but is not impossible if one feels that the theological teaching of the sweep of scripture requires Adam, Eve, and the Fall. It is important to be honest that it is a theological conviction that is driving the interpretation of the data, though. There are also ways to understand the sweep of scripture and the fallen nature of mankind without reference to a historical Adam and Eve. These do not necessarily diminish the inspiration and authority of scripture as witness to the work of God in the world. It is also possible to view Adam and Eve as historical without being unique progenitors of the entire human race. John Walton has suggested that Adam and Eve are called as priests serving in sacred space much as Abraham is later called as the father of Israel. There are many clues to this sort of reading in the text of Genesis 1-4. This shouldn’t be a make or break issue. Rather, it is an issue where we need to spend more time and thought. You may also comment on Adam According to Jesus at Jesus Creed. This entry was posted in Adam, Bible. Bookmark the permalink. I am still wrestling with this issue, but I’m not yet compelled to teach the text with the caveat that they were possibly not historical people. Do you feel it necessary to add the caveat whenever you mention Adam and Eve? It depends on the situation and the central point of the teaching. Sometimes it is sufficient to simply avoid making points that would require certain interpretations of Genesis 2-4. For example, it is possible to teach on marriage using Genesis 2 without emphasizing a unique couple. When discussing the scientific evidence for a population of thousands rather than a unique pair at the head of a population pyramid I find it necessary to add the caveat that this does not eliminate the possibility that there was a unique Adam and Eve called by God – but it does require us to dig deeper into the text. Sure! I suppose if I was teaching in a passage that referenced Adam, or if I was teaching the narrative overview of the Bible, or even the human condition I wouldn’t feel super compelled to get into the nitty gritty of the historicity of Adam. I would just let them be the characters they are in the narrative. But you’re right, if I was teaching on the scientific origin of life, then yeah, it would be important to discuss the historicity of Adam.